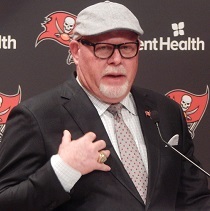 Bruce Arians is very quick to let a player know he screwed up. And Arians isn’t afraid to confess when he let the team down. After a loss to the Steelers, Arians had his weekly in-season Monday meeting with Cardinals team brass to address the previous game and to help hatch a battle plan for the next game. This meeting always includes Cardinals president Michael Bidwill. There, Arians explained to Bidwill how a chunk of the blame on the loss at Pittsburgh should be on his shoulders. That wasn’t the only news Arians shared with Bidwill. It seemed a practice squad player, Lawrence Okoye, a former British Olympic discus-thrower, had parked in Arians’ parking spot, a blatant act of insubordination in Arians’ eyes. On the first day of training camp, Arians promised his players he would cut anyone who parked in his spot. Defensive tackle Olsen Pierre was signed to replace Okoye and an NFL Films camera found Arians explaining the parking rule to Pierre on the sideline at practice. “That guy you just replaced? He parked there. We ain’t got many rules.” And Arians then walked away from the chat with a devious chuckle. The very next scene showed defensive lineman Calais Campbell addressing the team; he said lack of attention to minor details like parking in the wrong spot is hurting the team. Practices lead to a Monday Night Football game where the Cardinals host the Crows. The Cardinals are sharp early and even Arians can’t help but get excited. At one point when Baltimore has possession, defensive coordinator Jameis Bettcher walks up to Arians and tells him, “It’s third-and-20.” Arians screams at Bettcher what defense to run against Crows quarterback Joe Flacco. The Cardinals barely win that game and when the team returns to practice to face the hapless Browns, Arians makes it clear the Cardinals best not be looking past the Cleveland. The Cardinals, after trailing 20-7, rally with a strong second half to beat the Browns and Arians addresses his team at the Cardinals complex before the players head out on their bye week days off. The next scene shows Arians at his Georgia lakefront home hopping on his boat and heading out cruising the lake. “I need it to get through the season,” he said of his happy place tucked away in his little corner of the world. I hope #3 parks in his spot. I hope #3 parks in your spot and you see him pulling out with your wife in her robe smiling and waving goodbye! Hater! Bruce is a better version of a Jon Gruden type coach. This guy gets it. Players get him. Drastic turnaround this season. Don’t let the individual bull take over because those MFs are patting you on the back. Oh man, if that’s not a message that needs to be shared especially last year. Too many people playing for themselves around here. Until he wins a SB BA is not a better version of Gruden. 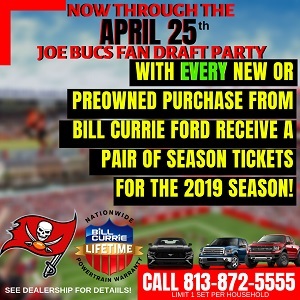 @TOM: I am noticing a similarity between the Bucs under Tony Dungy and Koetter. The Glazers pulled the plug on Dungy because the window of a solid defense was closing and replaced with an emotional, proven git ‘er done coach. Koetter got the apple and roadmap with an offense with a closing window (Winston?) and replaced by an emotional, proven git ‘er done coach. Only difference is Koetter lost 27 games in three years and benched the franchise quarterback and let the malcontents take over the locker room. Well, of course. There are some differences, but a lot of similarities, too. But when Dungy got the axe, Gruden came in and re-tooled the offense. When Koetter got fires, BA is retooling the defense. Had the Buc played even middle-of-the-pack defense, they’d have won many more games under Koetter. A team playing top defense but s#!t offense looks a lot better than a team with a top offense and s#!t defense in W’s & L’s. A similarity between DK and Tony Dungy, seriously, I am sure you are talking about circumstantially. Tony Dungy came in with a plan and was way more disciplined and the team played that way under TD. Tony Dungy and Dirk Koetter are both very good men. One had Brooks, Sapp and Lynch. The other had David, McCoy and Chris Conte. One had Monte Kiffin. The other had Mike Smith. That is why Dungy succeeded and Koetter failed. But the point Cobra made was spot on.